The exceptional performance and specifications of the SHV/NSHV series derives from SOC’s world-renowned and long-beloved cartridge fuses — tube fuses used together with fuse holders. This application note explains the internal construction of SOC’s uniquely designed and manufactured cartridge fuses and introduces the SHV/NSHV series. SOC’s compact and highly reliable cartridge fuses with AC 125 V and AC 250 V ratings for commercial power supplies are used extensively around the world. The SHV/NSHV series accommodates both DC and AC voltages as well as higher voltage ratings, building upon SOC’s exceptional cartridge fuse technology and becoming a breakthrough product across a wide range of applications. SOC’s cartridge fuses are produced based on the unique design below. By inserting the fuse-element through openings in the center of SOC’s uniquely designed end caps and soldering the fuse-element to the end caps from the outside, we establish firm solder joints and accurately align the fuse-element in the center of the fuse. This construction results in a mechanically robust, highly reliable fuse with low electric characteristic variance. If production speed is a priority, one may apply solder to the end caps in advance and solder the end caps and element by indirectly applying heat from the outside. However, this method results in less precise solder joints and weaker mechanical strength, leading to electric characteristic variance. Therefore SOC employs the more mechanically reliable method. The robust design of SOC’s cartridge fuses is well suited for mobile devices, automobiles, devices with motors or compressors, outdoor equipment, and other applications that experience irregular vibrations or changes in temperature. Measurement devices and control units will also benefit from the exceptional precision of our cartridge fuses. While standard ∅ 5 x 20 mm and ∅ 6.3 x 32 mm cartridge fuses are specified for rated voltages of up to AC 125 V or AC 250 V, the SHV and NSHV series offer superior performance (DC 250 V – DC 700 V) with the same size. 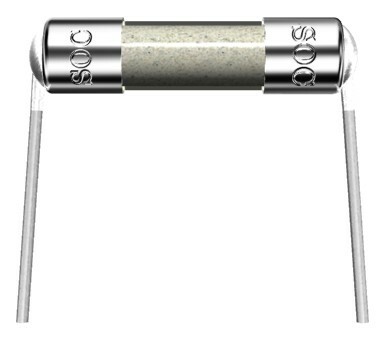 This is possible due to carefully selected materials and specially designed fuse-elements. The SHV and NSHV series are cartridge type fuses of various sizes (∅ 5.2 x 20, ∅ 6.35 x 25.4, ∅ 6.35 x 31.8, ∅ 0.3 x 38.1, ∅ 10.4 x 40 mm) used in inverters, air conditioners, fully automated dishwashers, fully automatic washing and drying machines, converter/inverter circuits for solar power conditioners, household fuel cells, UPS, and other applications. These fuses are also suitable for protecting the auxiliary circuit equipment of electric vehicle DC–DC converters, onboard chargers, and motor-driven compressors. To ensure the highest reliability possible, we conducted extensive testing according to IEC as well as internal standards in our comprehensive test facility before qualifying and releasing the SHV and NSHV series. Our facility houses a wide array of testing equipment, including six-phase full-wave rectification equipment and a large-sized capacitor bank for DC breaking capacity tests. Test reports for both series are available upon request. The technical prowess of the SHV and NSHV series can also be seen in next generation vehicles as larger fuses are deployed to protect EV driving circuits and auxiliary circuits. Application: Next generation vehicles (DC-DC converter, motor-driven compressor, onboard charger, fast charger, non-contact feeding device, etc. ), renewable energy devices (power conditioner, photovoltaic power generation panel, home power storage device, etc. ), semiconductor equipment, air conditioners, and more. Note: This application note shows representative values of the product specification. Please refer to each product specification for details. For more information, please visit the “Product Search” page of our website or contact us via our website.